Warning: this article contains locker-room talk. It’s not as bad as Trump’s though. Last night in the locker room after my hockey game (Ligue Bonne Entente de Vanier!) a couple of the guys were asking me about house prices in Orleans this year. They’re under the impression that prices are down – they asked me if the market is sinking. A couple of months ago there was an article in The Citizen that included some Ottawa neighbourhood home sale statistics and an overall conclusion that the West end is hot and the East end is, well, sinking. Home sales overall in Kanata did increase more than in Barrhaven or Orleans from 2015 to 2016. What they didn’t mention is that 200 to 300 more homes changed hands in Orleans compared to the other two suburbs. But the hockey boys were talking about price. And yes, prices for freehold homes did increase more in the other two suburbs than in Orleans. Orleans prices were pretty flat. After my game on Tuesday, I wanted to take a quick look at what’s happening this year. I’ve only worked two transactions in Orleans this year, representing the Seller in both cases. One was a townhouse that sold in 14 days for 100.3% of the asking price with competing offers and the other was a three-bedroom detached home that sold for 97.9% of the asking price in 22 days. From my small sample set, the prevailing seller’s market for freehold homes in Ottawa this year seems to include Orleans. What I told them on Tuesday is that house prices at any given time depend wildly on specifically where you’re talking about. Asking how Orleans prices are doing is fine, but typically what you’ll see is that they are up in one area and down in another. 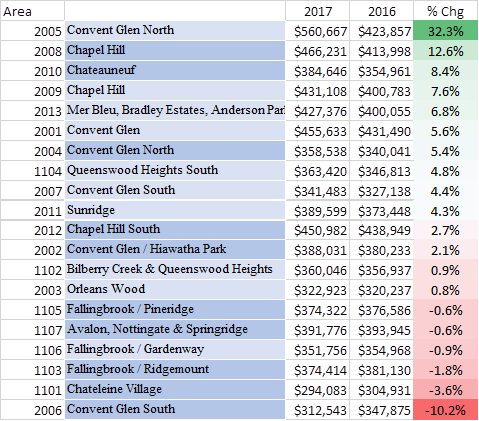 To the end of August, here are all the individual neighbourhoods in Orleans ranked by change in average selling price year to date in 2017 compared to 2016. Is this a picture of an area where the market is sinking? Obviously the number of homes sold in each area is not necessarily large enough to make for a statistically accurate sample, but the bottom line is that real estate is alive and well in Orleans. People talk about the RCMP and DND moving West and South in Ottawa. They never mention the massive development at CSIS / CSE in the East end, the burgeoning commercial areas around Trainyards and Blair Station, or even the continuously sprawling build-out of homes and commercial property in every direction around Orleans. 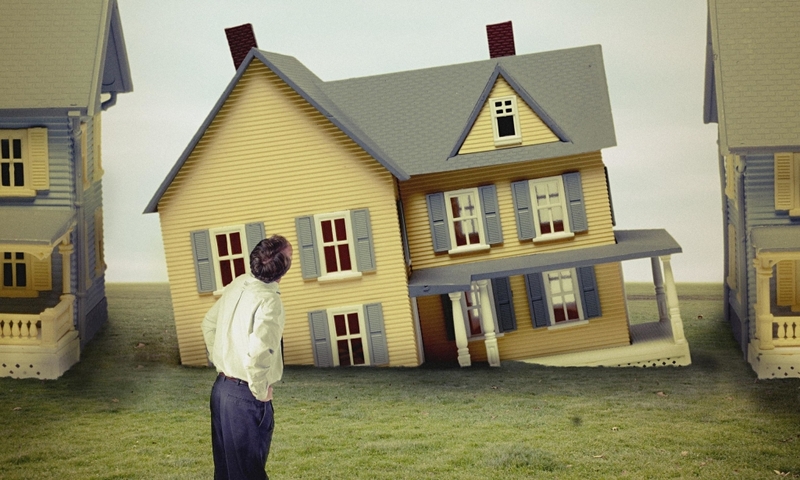 New builds come in waves and sometimes take a little wind out of re-sales. Orleans isn’t sinking; no worries if you can’t swim.